Join the UC Berkeley Symphony Orchestra for our second concert set of 2017! Maestro Milnes conducts an otherworldly program of masterworks new and old. Catch a glimmer of our tour to Spain through Debussy's "Iberia," an atmospheric painting of early 20th century Spain. Then experience the world premiere of UC Berkeley Composer Dr. Amadeus Regucera's "Skin, stretched upon the frame." 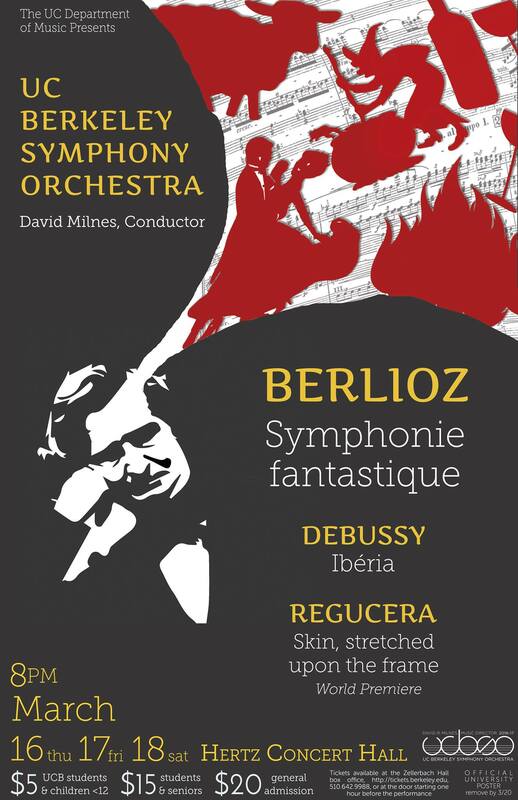 Finally, breathe deep the intoxicating fumes of Hector Berlioz's extravagant "Symphonie Fantastique," the rambunctious tale of love, drugs, and death. We hope you will join us for this fantastical evening! The UC Berkeley Symphony Orchestra is one of the premier university ensembles in the nation. Now in its 20th season under Music Director David Milnes, the UCBSO has solidified its reputation as a major force among Bay Area cultural institutions. Established in 1923, the UCBSO performs 15-18 concerts each season, covering the full repertory from the Baroque to the present with a special emphasis on music since the 20th century.